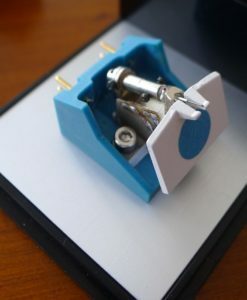 Cala Mighty Sound modification for your existing EMT TSD15 cartridge. The TNT15 range of cartridges is our flagship and have already been awarded with a Gold Reference in Haute-Fidélité magazine (February 2017 – France). 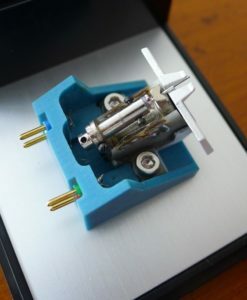 From the original EMT TSD15 generator we keep only the structure and the coil former in order to build something radically different allowing low impedances (6 or 12 ohms) for a standard MC output (0.2 or 0.4 mV/5cm/s), silver or copper carefully hand winded coils directly soldered to output pins with no capacitors in the signal path, new Silicon Frictionless two pieces damper© and of course different bodies available in different materials (stone, wood, multi sythetic material, graphite) and finishes. We are able to deliver a cartridge tracking at 100 μm/315Hz/17mN with our TNT15 Evolve using one of the smallest diamond tip available (Micro Ridge 0.1*0.1mil super polished). The TNT15 range of cartridges is a unique way to rediscover vividly every details of your records with it’s extreme tracking abilities, low distorsion patterns and pitch black background noises.